Getting in FORMATION to win in 2016, 2017, & 2018! Atlanta Jobs with Justice believes that all workers should have collective bargaining rights, employment security, and a decent standard of living within an economy that works for everyone. For us to achieve this mission in Georgia we must shift the power structures that hold our state minimum wage at $5.15 an hour. Our minimum wage is a national and global joke! We want you and organizations with similar missions to join us as we get in a formation that makes Georgia a great state for all working families. The Atlanta JwJ coalition is preparing to do two galvanizing events on April 30th and May 1st for International Workers Day (#MAYDAYATL). We want to give our members what they love while we build power for the things we need. 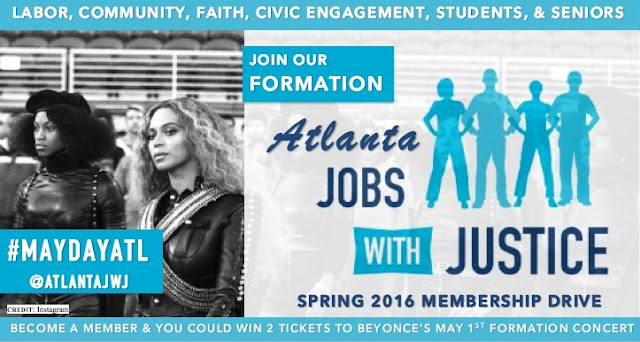 Our spring 2016 membership drive comes with a chance to win Two BeyHive tickets to Beyoncé’s Atlanta Formation concert on May 1st 2016. If you earn $15 or less per hour your membership is only $25 a year. If you earn more than $15 an hour become a member for just $60 a year. If you canvass, phone bank, or table with us before April 23rd you will receive additional entries into the raffle. This membership drive is about building our power to win, come help us grow the movement. As a coalition organizing for economic and social justice we understand that almost half of working Georgians make less than $15.00 an hour. Events like this concert are too often out of reach if not impossible for our members to attend. Our coalition fights for all workers to be able to care for their basic needs as well as enjoy a live concert with our favorite stars. We work hard and we earn it day in and day out, yet corporations and politicians consistently leave our families in poverty. They seriously think we can survive on $5.15 or $7.25. As we work to change this we want at least one or two of our members to enjoy the life we are fighting for all Georgians to have. Join the movement and maybe it’s you who is watching Beyoncé Live! You must join before Sunday, April 24th, 2016. Atlanta Jobs with Justice has our eyes on the prize. Together we will build and show the power necessary to win for our communities. The way we get in formation the next three years will deeply determine our children and grandchildren’s future in Georgia. 2016, 2017, and 2018 deeply matter for the movement in Georgia. Labor, Community, Faith, Civic Engagement Groups, Reproductive Justice, Anti-State Violence Activist, Workers, Immigrants, First Nations, LGBTQ, Incarcerated and Formerly Incarcerated, Students, & Seniors - This membership drive is for us to get in formation for a just economy. Together we will raise wages, expand healthcare access, create good jobs, great education, and strong families. Become a member of the #JwJFormation AND come together for #MAYDAYATL. In the rich history of international and local worker struggles we will parade our pride for our movement for economic and social justice! More details about these events will be released soon, so stay tuned. We look forward to you joining us in growing power for economic justice in Georgia. 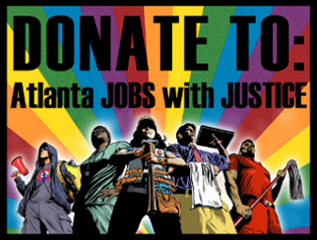 Become a member of Atlanta Jobs with Justice TODAY!